Hi everyone!! I hope your weekend is going great. This weekend, I am scrapping with some friends that I met online. 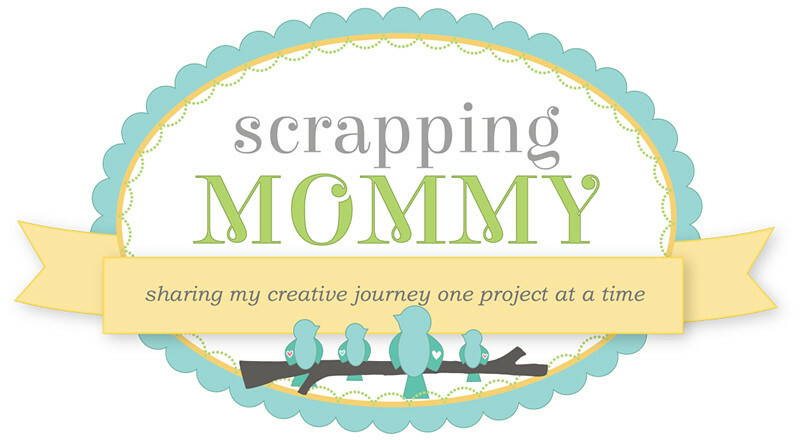 We go to the ScrapbookUSA Expo in Sandy, Utah and then spend the day scrapping at a scrapbook store the next day. I hope to have some fun scrapping stuff to share with you when I get home. It is my turn today to share on the ScrapbookPal blog a card that I made with the Heritage Cricut cartridge. There are so many wonderful cuts on this cart such as heritage and pioneer images as well as frames and charms, plus a full font with shadow and some great family words. ScrapbookPal also sent me the matching Cuttlebug Heritage Cricut Companion embossing folders and some Smooch accent ink to work with. 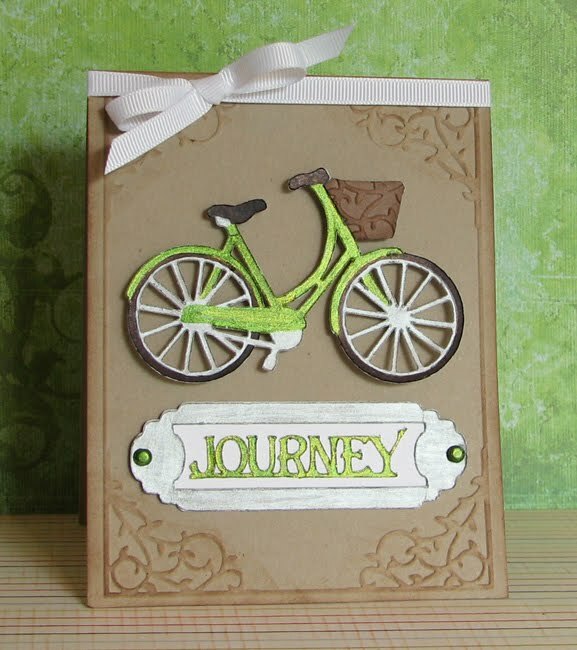 I used white cardstock for all the cuts on this card (except the basket on the bike) and just colored them in with the Smooch accent ink. This was my frist time using the Smooch accent ink and I love the results. 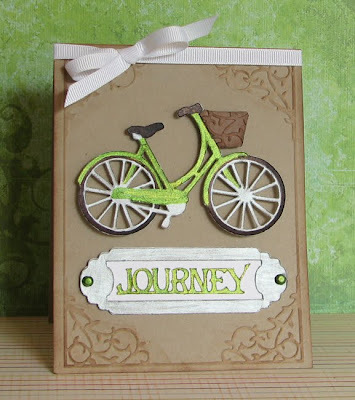 It is a wonderful accent for the die-cuts and gives a great shine. 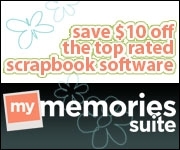 -For the card base, cut a piece of kraft colored cardstock to 4 1/4 x 11 inches. Fold it in half to make a 4 1/4 x 5 1/2 inch card. -Emboss the card front with one of the embossing folders from the Cuttlebug Heritage Cricut Companion embossing folders and then rub a Colorbox Fluid Chalk Cat's Eye Ink Pad in Chestnut Roan over the embossed image to help it stand out a little. -Using the Cricut Expression and the Heritage cartridge, cut the bicycle image on page 63 of the handbook at 2 1/4 inches in white.....I did cut out an extra bicycle in brown and then just used the basket from the brown bicycle over the white basket. I also embossed the brown basket with the corner embossing on the Cuttlebug Heritage Cricut Companion embossing folder before I adhered it to the bike. 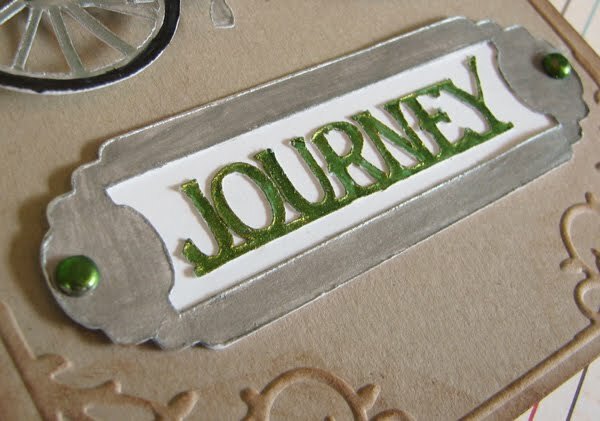 -Cut the word "JOURNEY" on page 71 at 1/2 inch in white. -With the Smooch accent ink color in the bicycle frame with Green Apple and wheel spokes with Silver Fox. Color in the tire, seat and handlebars with a black marker. Color in the Journey with the Green Apple and the top layer of the frame in Silver fox. Use the Green Apple Smooch to color two small brads. The Smooch accent ink really gives the bike and frame a great shine and it dries really fast on paper, but I used my heat gun to speed up the drying process on the brads. -Layer the frame and add the "JOURNEY" cut to the center of the frame. -Assemble the card as shown in the picture. I did add some dimensional adhesive under the bike to raise it off the card a little bit. -Tie a white ribbon at the top of the card. 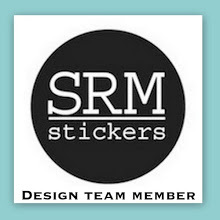 Cardstock, ribbon, brad, dimensional adhesive: Stampin' Up! Thanks for visiting!! I appreciate your comments. This card is so perfect on so many levels...I just can't stop looking at it! I just LOVE it! Awesome card! Love the colors and embossing. Awesome job on this card! Your Heritage mini album I saw yesterday is amazing, too! WOW! This card is so amazing! I love the embossing details!